A recurring theme within contemporary art photography has been the imperative to address the biased or unavailable historical representation of the Black, female body. Since the 1990s’ artists like Carrie Mae Weems, Renee Cox, Xaviera Simmons and now Nona Faustine, have used photography to recognize Black womanhood in all its unattested complexities. In the photographs shown below, each artist has settled their melanated bodies within their landscape of choice – sites that have witnessed unspeakable violence, marooned existences and/or enlightened encounters. Carrie Mae Weems. Dreaming in Cuba, 2001. 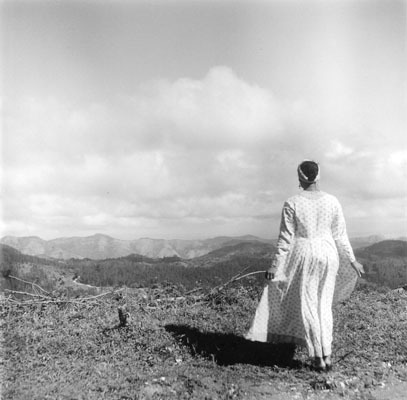 Arguably the most prolific in her use of self-portraits within landscape, Carrie Mae Weems’ elegant figure has crossed the lens of several different bodies of work starting with her 2001 Dreaming in Cuba series. Unlike the other artists discussed, Weems more often than not stands in opposition to the lens, as if leading a group behind her. Exaggerated by robes or gowns, Weems’ figure floats into the frame, inserting the Black, female body into spaces from which its presence was forgotten or previously denied entry. Launching her art career after a two-year pilgrimage retracing the TransAtlantic slave trade with Buddhist monks, Xaviera Simmons’s concern with wilderness explores spirituality in art. In previous works, Xaviera has used photography to create (self) portraits in both constructed and natural environments that question African-American identities and their relationships to those settings. Renée Cox. River Queen, (from the Queen Nanny of the Maroons series), 2004. Although all of these artist perform for the camera, Renee Cox’s work is most dramatic in its telling of the stories of Black female figures like Queen Nanny, the only female national hero of Jamaica. Taking advantage of the physical strength expressed by her own, muscular body, Cox is concerned with self liberation and challenging the predetermined roles imposed on Black women. Nona Faustine. “ ‘. 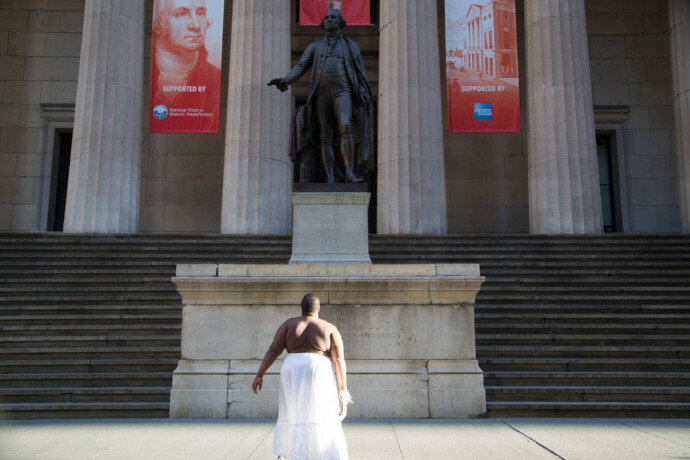 . . a thirst for compleat freedom … had been her only motive for absconding.’ Oney Judge, Federal Hall NYC,” 2016. Continuing this photographic tradition, Faustine’s work brilliantly hits at the intersection of two major socio-political conversations of the 21st century: the #BlackLivesMatter and body size acceptance movements. 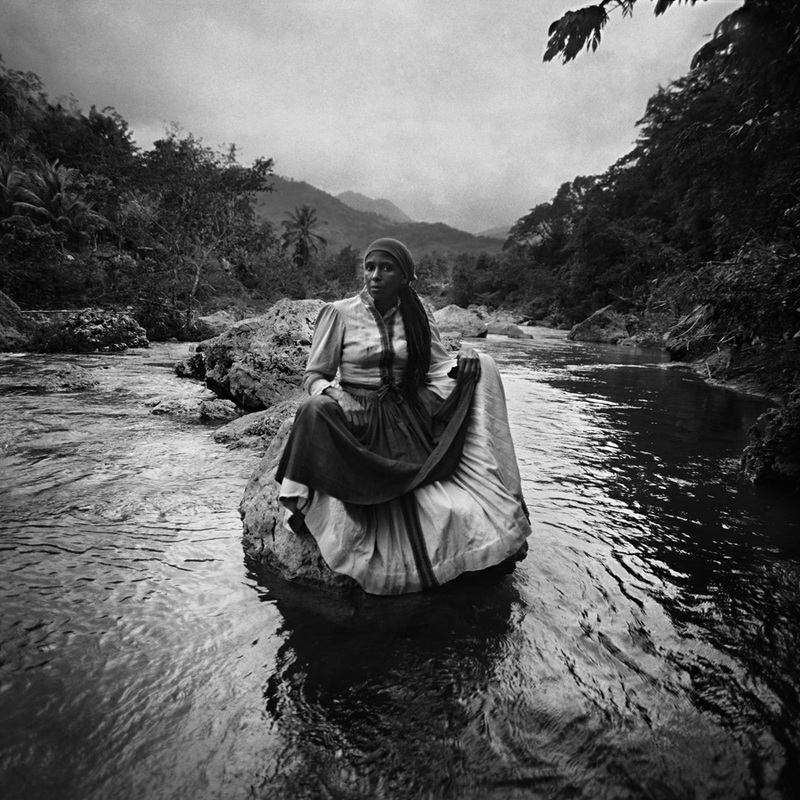 Standing on sacred, scarred or political North American spaces, Faustine’s self-portraits ultimately function as archaeological documentation. In its robust form and stoic posture, her body is a blatant reminder of chattel slavery yet also channels (art) historical representations of the feminine – from fertility goddesses/Venus figures to ancient Egyptian statuettes. Faustine’s use of poetic captions with each photograph is particularly unique as she educates the viewer of what lies beneath these commonplace landmarks and tourist attractions. As commentary on issues that haunt our past and present realities, the images in White Shoes and in Faustine’s follow up exhibition at Baxter St are timeless, visualizing the cycle of (our country’s) birth, (economic) growth, death and rebirth. Nona Faustine’s solo exhibition, My Country, closes this week at Baxter St. You can also see her talk at the Brooklyn Museum this Saturday, January 14th. Qiana Mestrich is a photographer, writer, digital marketer and mother from Brooklyn, NY. She is the founder of Dodge & Burn: Decolonizing Photography History, a blog that seeks to establish a more inclusive history of photography, highlighting contributions to the medium by and about people of underrepresented cultures. Read her other guest posts on the Baxter St blog: Photography and the Black Panther Party, The Black Female Self in Landscape and In Memoriam: John Berger and Uses of Photography Quotes.